The Skinny: Life Without Principle is a razor sharp look at Hong Kong and its obsession with money, and captures the local zeitgeist in a way Johnnie To never has before. Incomplete story and characters drop this one down a notch, but this is an incisive, smart and well-observed film. Not Johnnie To's best, but expecting that is simply asking too much. Johnnie To has long been a great filmmaker, but a socially relevant one? Not as much. Election 2 is the closest To has ever come to making a film about Hong Kong, and that film’s take was allegorical, using a gangland election to present To’s particular view of the “Special Administrative Region.” Election 2 represented Hong Kong, but was it really about what happens in Hong Kong and to its people? Nope. Given that, Life Without Principle is new territory for To, as it’s about the things that concern Hong Kong people every single day. It’s also not about the things that concern Johnnie To’s international fanbase, i.e. brotherhood, honor, guns and other fanboy genre staples. What bridges those concerns: triad characters and Johnnie To’s use of irony, which is so dry and sharp here that it appears to be something new. But it really isn’t. The subject may be different, but the arch sense of humor ultimately reveals Life Without Principle as To being To yet again. Not that there’s anything wrong with that. To uses a large cast of characters to tell a number of stories, but focuses on three characters in particular. Bank officer Teresa (Denise Ho) is looking at the inevitable pink slip for her poor performance, and under pressure to make her numbers, she foists a high-risk fund on the wrong customer. Cop Cheung (Richie Jen) is busy chasing an elderly murderer and investigating the death of a loan shark who was bludgeoned in an underground parking garage, plus he’s distracted by his wife Connie (Myolie Wu), who's so set on buying a new high-rise flat that she opts for an unwise loan. Finally, loyal but inept triad Panther (Lau Ching-Wan) takes a breather from the archaic triad underworld to broker stocks for former colleague Lung (Keung Ho-Man). Panther is diligent but given his comic bluster one wonders how he'll really do when it's time to start trading funds. Then IT ALL GOES TO HELL. The stock market takes a precipitous tumble, sending everyone into a mad scramble to buy, sell or get the hell out. Tensions rise, events crisscross and soon the ridiculous, dark and greedy heart of Hong Kong is exposed. Or something. Life Without Principle is about money, money, money and how it changes, distorts and makes us who we are. Lives are compromised, people are enslaved and fates change in a second thanks to the all-consuming power of the [Hong Kong] dollar, and To gets this everyday tension across in remarkable fashion. Teresa has a small office at the bank, and it seems even smaller thanks to the nervous customers and the life-changing (and illegal) decision she’s about to make. Characters sweat profusely, nervously check their stock ticker, and fill banks and stock trading offices with so much suffocating panic. Money motivates everyone – except perhaps Panther and Cheung, who are more representative of To’s usual archetypes. Cheung is an honest, forthright cop, and though his wife lambastes him for being stubborn and indecisive, he’s anything but when putting his life on the line for his job. Panther believes in righteousness and brotherhood, but everyone around him is self-serving or up and quits when it doesn’t suit them. 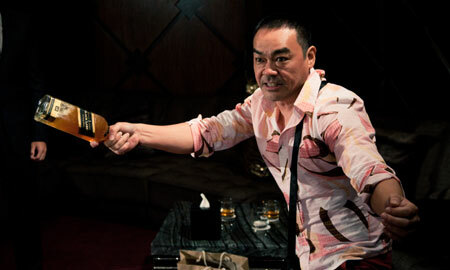 Cheung appears admirable for his stoic cop cool, but Panther an ineffectual parody of the glamorized Hong Kong gangster. This tense and sometimes ironic portrayal of Hong Kong makes up much of Principle, and the observations cut even deeper because the ironies are so very true. Banks offer to invest your money for you, but they charge exorbitant handling fees and sometimes risk their customers’ futures in order to guarantee their earnings. Money-mad Hong Kongers will speculate without research or thought, dooming their nest eggs because they’re blinded by the allure of a few extra percentage points. An ex-triad (Felix Wong Yat-Wah) recycles cardboard for a living, and he makes more money now than he did as a gangster. The rise of China, the sad decline of the triad underworld - Johnnie To and his writers spent years on Life Without Principle, and if they used that time to mash these smart details into a larger narrative, then it was time well spent. Principle has lots of dialogue, but the meat isn’t what’s said but what’s happening behind, around and because of the words. Observations and minutiae are rich, every detail serving to up the tension or push To’s themes. Also effective is the film’s nonlinear storyline, repeating events from different perspectives to create suspense or lengthen the tension. Acting is across the board solid, with the actors playing gang characters getting the juiciest and most entertaining roles. Lau Ching-Wan's dopey affectations are convincing if not a little showy, and Keung Ho-Man and Terence Yin(!) earn extra credit for their blackly funny turns. The plot twists become increasingly exaggerated but never cross over into full-on comedy, Johnnie To’s touch remaining controlled and stylistically real. The irony and satire are razor sharp here, revealing colder truths that tap directly into the Hong Kong zeitgeist. Still, the story is less impressive than the execution. The story leans too much on coincidence and serendipity, and the only character that really changes is Connie. The others simply remain as they are, showing us how they (and maybe we) might react in a chaotic financial meltdown. The results are revealing but never truly surprising. We know the lure of money can be blinding, and To doesn’t seem to tell us much more than that.